boost, full of complex harmonic character. The overall tone of the Saturn V gives a subtle openness to the top end of the frequency spectrum. 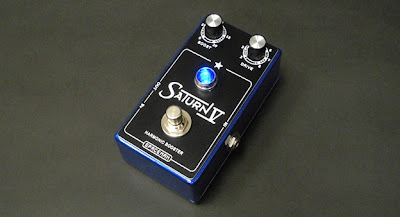 As great as this pedal sounds with guitar, it works equally well with bass and baritone guitar, as it keeps the bass frequencies present, tight and controlled. The harmonic distortion present in the Saturn V is extremely dynamic, dig in and the Saturn V will react. The drive texture is comprised of a mix of odd and even harmonics. The Boost side of the pedal is focused on even-order harmonics. While the Drive side of the pedal increases these even-order harmonics, it noticeably adds odd-order harmonics to the mix. While it excels as a harmonic booster, the Saturn V crosses the line into the realm of light overdrive when the Drive control is maxed. 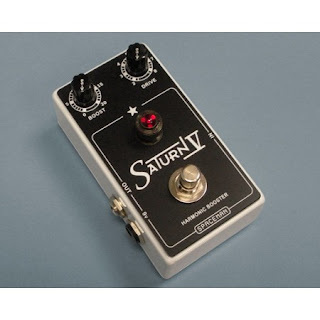 Completely hand soldered and handmade in Portland, Oregon, the Saturn V utilizes true-bypass switching via the heaviest duty mechanical footswitch available, while your tone is transferred via quality open-frame jacks. Open one up and you’ll see an unparalleled display of craftsmanship, with an immaculate hand-soldered PCB, detailed military-spec wiring and custom heavy-duty battery connector. On top of the USA cast-aluminum enclosure sits a durable, engraved vinyl faceplate and jewel indicator light. This pedal is built to last a lifetime. Each pedal is numbered on the nameplate, stating it's limited availability and in addition each is signed and numbered on the inside. The Saturn V also comes with a transferable five year warranty, plus a lifetime discount repair plan. This device is like no other we've come across. 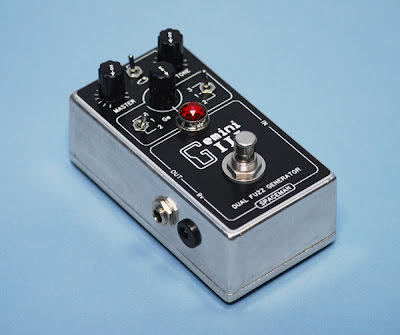 The main fuzz manipulator has a wide gain range and utilizes a mix of modern silicon transistors, a vintage Soviet germanium transistor and a custom integrated circuit. This signal can then be modulated in a unique way by a low-frequency oscillator, which can be fine tuned to transmit the desired message to our friends in deep space. Completely hand-soldered and handmade in Portland, Oregon, the WOW Signal utilizes true-bypass switching via the heaviest duty mechanical footswitch available. Open one up and you’ll see an unparalleled display of craftsmanship. Thick, high-quality PCB along with detailed military-spec wiring, using vintage US made heavy-gauge stranded wire. On top of the cast aluminum enclosure sits a durable, engraved vinyl faceplate and red jewel indicator light. This fuzz is built to last a lifetime. Each pedal is numbered on the nameplate, boasting its limited availability and in addition each is signed and numbered on the inside. The WOW Signal also comes with a transferable three year warranty, plus a lifetime discount repair plan. Pre-orders are available with advanced payment here at Elevation Boutiques. Introducing the Aphelion Overdrive, the latest Spaceman tone machine, built to inspire. 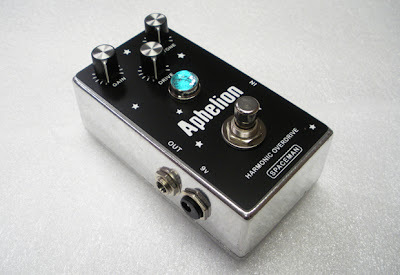 The Aphelion is a harmonically rich overdrive pedal, with an emphasis on even-order harmonics. It has a wide gain range from light sparkle, to overdriven tube-amp bliss. The pedal is wonderfully transparent and extremely responsive to playing dynamics. To our ears, it’s the most realistic tube-amp overdrive tone we’ve ever heard in a pedal. In standard Spaceman fashion, we’ve come up with an exciting, unique design that makes it truly one of the most organic and dynamically responsive overdrive pedals on the planet. The Aphelion creates unique drive tones and with a sea of cloned overdrive circuits out there today, this means so very much. The drive possibilities of the Aphelion range from a sparkly, shimmering boost to high-gain overdrive, with plenty of boosting power on tap. The tone control lets you balance highs and lows, with full range at 12:00. Use your neck pickup with high gain settings for singing, harmonic-laden lead tones. Completely hand-soldered and handmade in Portland Oregon, the Aphelion utilizes true-bypass switching via the heaviest duty mechanical footswitch available. Open one up and you’ll see an unparalleled display of craftsmanship. Thick, high quality PCB along with detailed military-spec wiring, using vintage US made heavy-gauge stranded wire. On top of the USA-cast aluminum enclosure sits a durable, engraved vinyl faceplate and clear jewel indicator with turquoise LED. This overdrive is built to last a lifetime. Each pedal is numbered on the nameplate, boasting it's limited availability and in addition each is signed and numbered on the inside. The Aphelion also comes with a transferable three year warranty, plus a lifetime discount repair plan. The Gemini III is an all-discrete (no IC's) transistor fuzz. 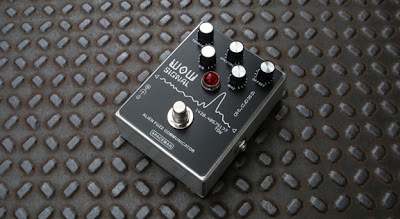 It features two different fuzz circuits in parallel, one vintage germanium and the other, modern silicon. The germanium side uses vintage 70’s, NOS AC128 transistors, prized for their classic fuzz-tone. The two vastly different fuzzes are blended together via the Ge/Si knob for a layered fuzz tone. Each fuzz has a choice of three gain settings via toggle switch. The Master knob controls the output of the final mix, and has enough gain on tap to cause a supernova. The unique tone control affects each fuzz independently, yet at the same time. 12:00 yields a balanced full range fuzz, turn CW for a fantastic mid-scoop and CCW to smooth out the highs. The remaining toggle switch controls the direction of the tone-sweep for the germanium side, allowing for opposite sweep directions. The controls allow for many tone combinations between the two fuzz circuits, for some very unique fuzz blends. Completely hand-soldered and handmade in Portland Oregon, the Gemini III utilizes true-bypass switching via the heaviest-duty mechanical footswitch available. Open one up and you’ll see an unparalleled display of craftsmanship. Thick, high quality PCB’s, along with detailed military-spec wiring using vintage USA made heavy gauge stranded wire. On top of the USA-cast aluminum enclosure sits an engraved vinyl faceplate and custom engraved knobs. This fuzz is built to last a lifetime. The Gemini III covers a wide range of usable fuzz territory, including lower-gain classic tones, heavy high-gain/scooped-mid tones and so much more. There's plenty of low frequency response on hand to make for an equally awesome bass fuzz (highly recommended for bass). Also great for baritone and synth. Each pedal is numbered on the nameplate, boasting it's limited availability, and in addition each is signed and numbered on the inside. The Gemini III also comes with a transferable three year warranty, plus a lifetime discount repair plan. 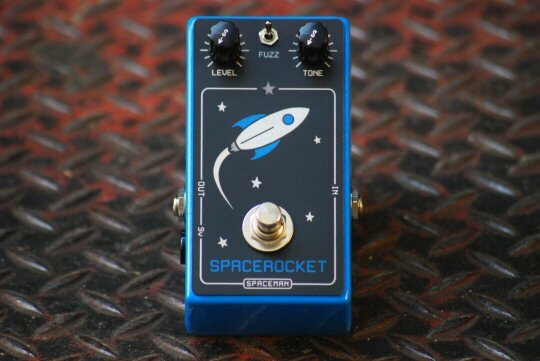 The Spacerocket is a discrete silicon transistor fuzz. It has a simple layout with three controls: Tone and Level, plus a 3-way toggle switch to control Fuzz gain. On top sits a reverse-engraved, hand painted vinyl faceplate with backlit indicator. Instrument attack is reflected by an indicator located in the rocket's "flame." The Spacerocket emits otherworldly fuzz tones. The hottest Fuzz setting is a blistering compressed fuzz bomb, with layers of fuzz ringing through. With other Fuzz settings, metallic intermodulated robot fuzz is possible. This fuzz shines when used for single string lead lines - Saturated multi-dimensional fuzz that blooms in between notes. With chords and multi-string playing, you can achieve much different effects - with cancelled out frequencies, metallic and noisy fuzz. Handmade in Portland Oregon, the Spacerocket features an all discrete (no IC's!) tone path, military-spec wiring and the very highest quality components. Everything is neatly held in a super-duty USA-cast aluminum enclosure, topped with a durable engraved faceplate. The True Bypass switching is provided care-of the heaviest-duty mechanical footswitch available, for a long trouble-free life. There are two editions available, Blue powdercoat and unfinished Silver. Blue is limited to 20 pieces with blue indicator. Silver has a white indicator and is limited to 50 pieces. Each pedal is numbered on the nameplate, boasting it's limited availability, and in addition each one is signed and numbered on the inside. The Spacerocket also comes with a transferable three year warranty, plus a lifetime discount repair plan. Capable of up to 11 G's of clean gain; the clean boost function alone can drive your tube-amp from a light breakup to thick, all-out distortion. Now you too can blast yourself (and your audience) into the outer limits of the universe. The Mercury III also generates tube-like, even-order harmonics, which can then be mixed in with your original instrument signal, bringing more dimension and life to your tone. Set the Harmonic setting at minimum and you’ll have a clean boost. Turned to max, your tone is now twice as rich in harmonic content! The unique tone control provides six (6) tone selections, which are interactive with the Boost and Harmonic controls. Together you can achieve a variety of settings, effectively making the Mercury III a Full boost, Treble boost, Bass boost and Mid boost all in one compact pedal! Let's also not forget the included NOS 1966 germanium transistor for its wonderful vintage sparkle, heard especially in the treble boost settings. Handmade in Portland Oregon, the Mercury III features an all discrete (no IC's!) tone path, military-spec wiring and the very highest quality components. Everything is neatly held in a super-duty USA-cast aluminum enclosure, topped with a durable engraved faceplate. The True Bypass switching is provided care-of the heaviest-duty mechanical footswitch available, for a long trouble-free life. Each pedal is numbered on the nameplate, boasting it's limited availability, and in addition each one is signed and numbered on the inside. The Mercury III also comes with a transferable three year warranty, plus a lifetime discount repair plan. Three (3) versions are available and are limited as follows: Copper Plated (1-10), White Powdercoat (1-30) and Raw Silver (1-80). In addition to fancy coatings, the Copper and White versions (ONLY) feature vintage, NASA surplus dimmable indicator lights! Amber in color, the Copper edition uses a "hazard" style display, while the White uses a standard display. The Silver edition uses a jeweled indicator. It's a tone enhancer that blurs the line between boost and overdrive. 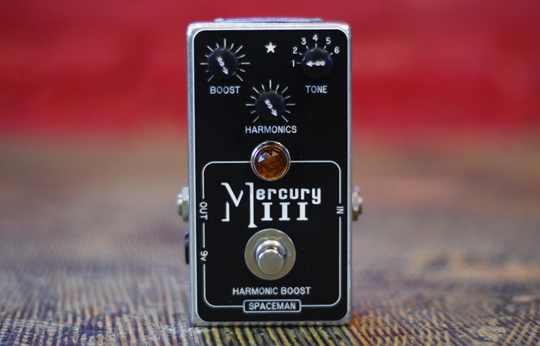 The Mercury III works with your guitar and amp to achieve a large variety of tones. Its features add life, sparkle, volume and thickness to the tones already present – and without compromise. Elevation Boutiques began in 2010 to bring the best in boutique gear to musicians. We represent a number of boutique brands by aiding them in direct sales, marketing and customer service. We provide both dealers and customers the unique opportunity to demo boutique gear from all over the United States. This hands-on approach helps boost product sales while keeping additional costs down and helps supply the customer with a more affordable product. All Online Sales Are Final. Elevation Boutiques. Powered by Blogger.